Opposition Presidential candidate Maithripala Sirisena yesterday said that no computer jilmaart (fraud) had taken place at the 2010 presidential election and there was no room for a fraud at future elections as well. Sirisena said that no irregularity had happened in the presidential election where former Army Commander Gen. Sarath Fonseka lost to incumbent President Mahinda Rajapaksa. 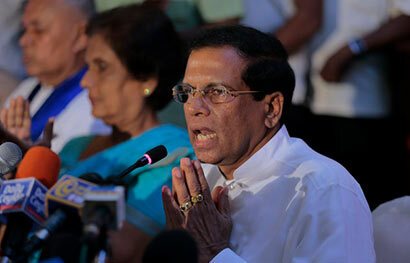 Sirisena was addressing a gathering of heads of print and electronic media yesterday at the Solis Hotel, Pitakotte. “There was no one to contest against President Rajapaksa in 2010 following the war victory as he had led the war,” Sirisena said, adding that he should thank Gen. Fonseka for coming forward to challenge Rajapaksa at that time. President Rajapaksa’s victory was very clear in 2010 and there was no room to fraud or jilmaart, Sirisena said adding he was surprised that Gen. Fonseka had been able to poll so many votes. But, President Mahinda Rajapaksa had told electoral organiser of the SLFP at Temple Trees that the government would win the election at any cost even by jilmaat, Sirisena said, adding that he believed it was an unnecessary statement. Asked whether this time the UPFA would attempt to manipulate the results, he said that the ruling coalition could not do so. Sirisena said that he did not go to the counting centres except for his first general election in 1989 and went to bed around 10.00 pm on the night of the election. “I have great confidence in the Elections Commissioner and his Department,” he said. He said that President Rajapaksa was ‘Mahinda Ayya’ of all in 2005 and a clean politician at the time. He was king of the people in 2010 with the war victory. But, today he was the leader of the most corrupt government. According to Sirisena, he would not be going to Temple Trees or President’s House after winning the January 08 election and instead would work from the Presidential Secretariat. Sirisena said that he had obtained the SLFP membership on July 01, 1967 before President Rajapaksa, who joined the party in 1969 as the Beliatte SLFP Organiser. Sirisena dismissed rumours that the government tried to create a military coup and set up a military government in case of the president’s defeat. There was no room for that and three forces who defeated LTTE terrorism would not engage in such acts, Sirisena said. He said that his election manifesto would be launched on Sunday. “Now the SLFP is running under ‘Chinthanaya’ policies, but I will reintroduce Bandaranaike policies. Answering a query, he said that former President Kumaratunga had been appointed Advisor to the party by President Mahinda Rajapaksa, but he didn’t take any advice from her. Sirisena promised to give suitable place to Kumaratunga as she was a member of the family which founded the SLFP. MY3 appears to be groping in the darkness. He does not demonstrate any political and/or social philosophies. We are being driven into a Liya like situation where the masses will have no option but to take to the streets after January. MY3 should forthwith divulge the source/sources of the funding of his election campaign. He has no access to SLFP’s funds and the UNP wouldn’t part with any of their funding. So, where is all the money coming from? The black BMW’s, private security, election offices, meetings in private venues, the list is endless. There’s helicopter hire too. Where is all the money coming from? ….From USA & there’s a news that his family has booked tickets to go to us on 8th jan. There will be a king of US, if he wins.